Jayapura, 1340: The streets of several centres across West Papua are being blockaded today by heavily armed Indonesian security forces in an attempt to prevent a planned gathering of tens of thousands of protestors who are demanding a Referendum on the future of the province. However, thousands of Papuans have reportedly ignored the strong military presence and are marching the streets of Jayapura, paralyzing the provincial capital with their huge numbers. 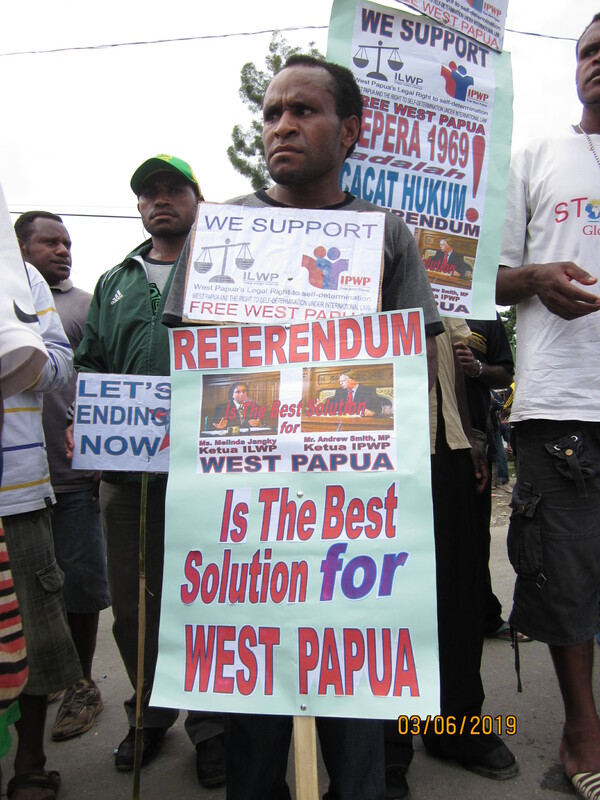 The protests, called by the West Papua National Committee (KNPB) and actively supported by the entirety of pro-independence movement, are being held to demonstrate both opposition to Indonesian rule and to the Indonesian-run dialogue process, in favour of legitimate internationally-mediated dialogue that takes into account the wishes of West Papuan people. The demonstrations are demanding a Referendum as the only lasting and credible solution to determine the future of Papua for Papuans. 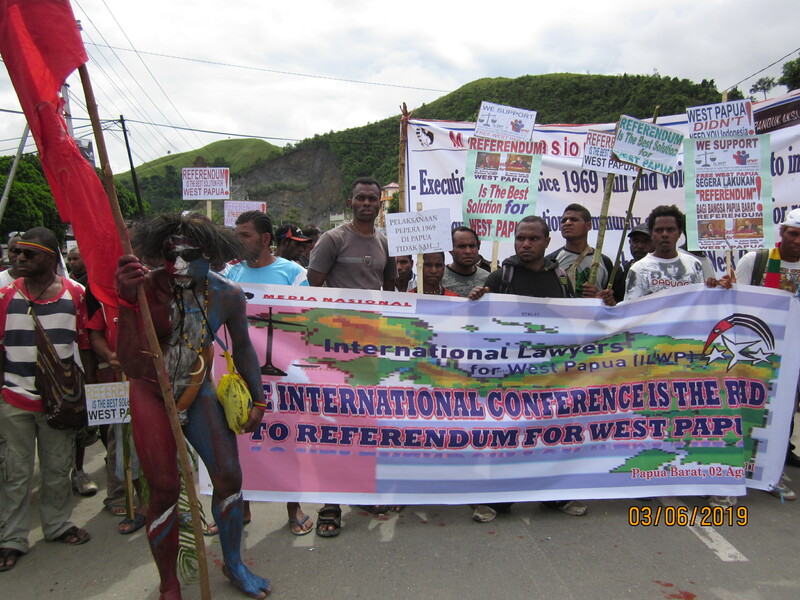 Outside Jayapura, protests are also being held in Wamena, Biak, Nabire, Manokwari, Paniai, and Timika. West Papua Media stringers on the ground in Abepura are reporting that the demonstrations outside the main Post Office were being blocked by hundreds of heavily armed riot police and soldiers. This is despite official permits being issued by the Jayapura police for the demonstration to proceed without hindrance. At 10am local time, three truckloads of soldiers and BRIMOB riot police then decamped and headed to Waena to intercept a long march of several thousand people who were attempting to join together with the Abepura march and then head to Jayapura, in information conveyed to West Papua Media by Daniel Wenda, Secretary General of KNPB. It is unknown at time of writing whether the march has pushed through the security force blockade or if any casualties or arrests have been sustained. Local human rights sources have reported that a recent spate of violent acts may have succeeded in keeping away crowds of over 10,000 people, with one person stabbed and wounded by a militiaman at a pre-rally gathering in Angkasapura. However in news just to hand, organisers of the rally are reporting that security forces have relented and several thousand people have now successfully joined the demonstration, which is continuing to grow. With tensions extremely high after the violence, the organisers of today’s rallies across Papua have been at pains to ensure that no symbolic traditional weapons be brought to the gatherings, and have worked with the Dewan Adat Papua to deploy hundreds of peacekeepers from the uniformed Community Security Force of Petapa, or The Guardians of the Land of Papua. Telephone communication to Jayapura has been sporadic with many calls being cut off and SMS communication delayed, making confirmation of events difficult. It is unclear if the security forces are currently preventing West Papuan people from actively communicating to the outside world. Reports are filtering through that other political actions are occuring throughout Papua simultaneously with the mass protests, with the KNPB suggesting that those who could not make it engage in innovative and non-violent economic disruption actions, such as strikes by ojek drivers, street vendors and bus drivers. Independence activists are also reporting that members of two pro-Indonesian militias — Besar Merah Putih and Aswain (headed by Euricio Guterres) — have been deployed widely across the Jayapura area in conjunction with security forces. Witnesses reported that late last night, a PELNI ship suspiciously landed 92 unfamiliar men at the main Jayapura dock, who are widely believed by activists to be members of Kopassus special forces in plain clothes. Activist surveillance of military facilities has indicated that special forces officers have not been seen at regular barracks for the past three days at least. Suspicions have also been cast on unidentified forces responsible for a spate of violent incidents prior to the nonviolent mobilisations, who are believed to be connected to the Indonesian security forces, in what many observers see as an attempt by the security forces to spread fear, panic and division among the demonstrators to prevent the protests going ahead. In the early hours of Tuesday morning, an arson attack on the Rectorate of the Cenderawasih University, Abepura, was foiled by Papuan students. The fire was detected before it took hold by alert from student security and was quickly extinguished. After attacks yesterday by unknown assailants on Indonesian transmigrants in Nafri, Abepura, sources are reporting that one person has been killed and an unknown number injured in another attack in Koya, where SMS reports from credible local sources have described several incidents involving shootings and stabbings. The Indonesian military has long had a policy of using civilian proxies and plain-clothes agents to carry out acts of violence to provoke civil resistance movements into self-defence. This has often been used as a pretext to engage in a security crackdown, which reinforces military dominance over the region. 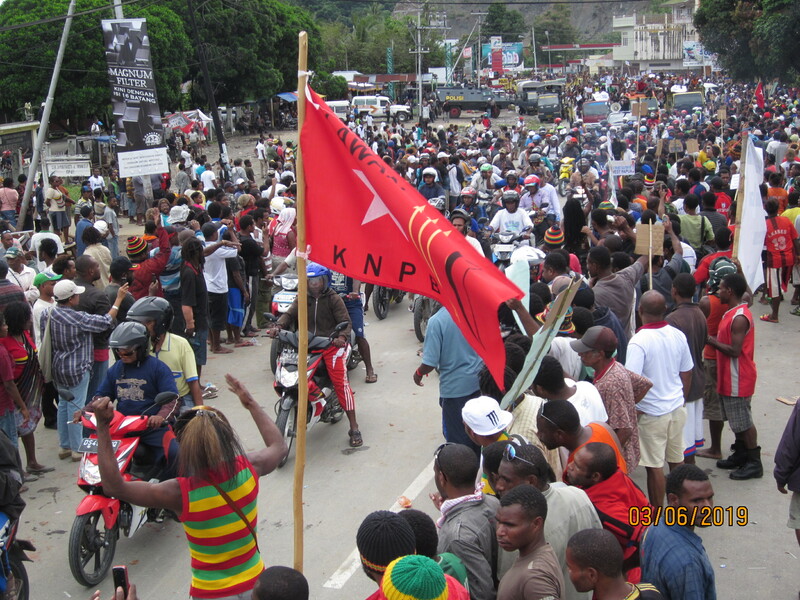 Elsewhere in Papua, the mass rally also being held simultaneously in Manokwari was prohibited by security force, according to organisers from the KNPB. However negotiations succeeded in Indonesian security forces relenting, and the rally is currently ongoing with several thousand people participating. This rally marched from the office of Dewan Adat Papua, and is currently outside the Department of Information in Sanggeng. The atmosphere is described as relaxed. 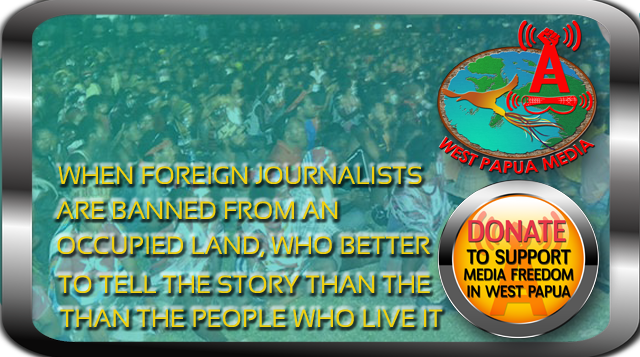 West Papua Media is monitoring events closely, and will provided updates on the situation throughout the day.